SpringHill Suites Orlando Airport is an all-suite hotel offering you first class service, located minutes away from all of the excitement of Orlando, Florida. Our Orlando Airport hotel is also just a short drive from the newly developing Lake Nona Medical City and area attractions. 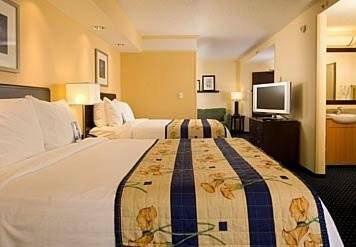 Whether your travels bring you to Orlando for a business meeting or simply to enjoy a day at the Walt Disney World theme parks, this Orlando Airport hotel is the perfect choice for a hassle-free and productive trip. Complimentary shuttle service will transport you right to our hotel's front door from the airport. You can then start your day with our newly updated complimentary breakfast buffet, including fresh cut fruit, cereal, pastries, and many other delightful options. In the evenings, take a short walk to popular local restaurants or enjoy your time by our outdoor pool. Our hotel offers free Wi-Fi, 24/7 fitness center, and complimentary parking. This is the perfect place to stay on your next trip to Orlando.